Daniel Shapiro and Brian Edwards speak at a Buffett Institute event on Thursday. The former U.S. ambassador to Israel discussed his views on the Israeli-Palestinian conflict and the role of social media in politics. Former U.S. ambassador to Israel Daniel Shapiro said Thursday that the only outcome that can resolve the ongoing Israeli-Palestinian conflict is a “two-state solution” that will create an independent Israel and Palestine. 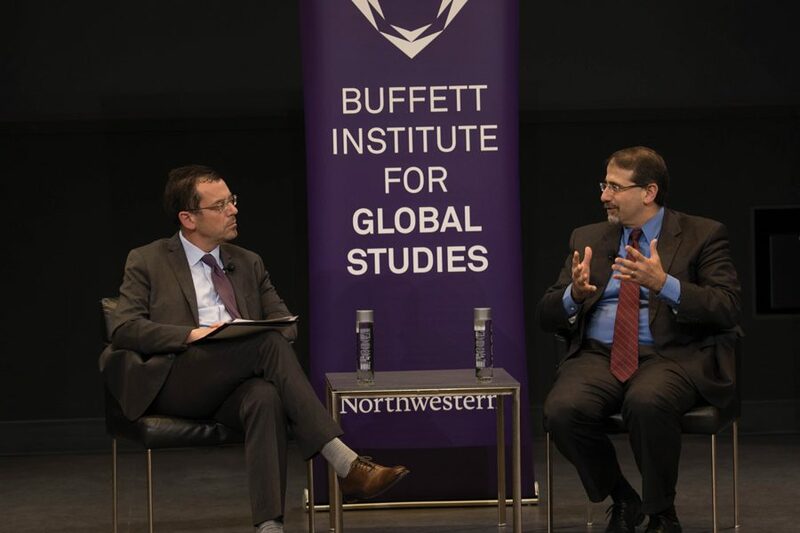 The event, held at McCormick Foundation Center, was hosted by the Buffett Institute for Global Studies and moderated by Brian Edwards, director of the Middle East and North African studies program. Shapiro, who was the U.S. ambassador to Israel from July 2011 to January 2017, also advised former President Barack Obama on U.S. responses to the 2010 Arab Spring uprisings. Shapiro said both Israeli and Palestinian leaders are constrained by their own publics, who remain divided over the Palestinian cause. It remains a challenge for both leaders to defend their people, Shapiro said. He added that although he believes there is only one resolution, other possible outcomes include an “extended version of the status-quo,” or the one-state solution, in which Israel annexes more or all of the West Bank. Edwards and Shapiro also talked about Israel’s overall response to the 2016 presidential election. Shapiro said President Donald Trump is more popular in Israel than most other parts of the world. Shapiro and Edwards also discussed the growing influence of social media in politics and diplomacy. They specifically addressed Trump’s use of Twitter as a political tool. Although platforms like Facebook used to have the power to mobilize thousands of people for mass protests, Shapiro said, authoritarian governments have learned how to use social media to their own advantages. Shapiro also said he finds the “emerging alignment among right-wing national movements” disturbing, referring in particular to the 2017 Charlottesville “Unite the Right” rally. There is an emerging danger of the normalization and allowance of anti-Semitic speech for political gain, he said. Bruce Carruthers, director of the Buffett Institute, told The Daily the program brought Shapiro to NU in an effort to enrich learning by creating opportunities for people to meet with experts on critical regions of the world.